After visiting all famous destinations inside/outside Hanoi and still having some free days, what will you do? Staying at your hotel or taking a walk around Old Quarter and seeing our local life. I think it is enough for you to see. Let’s go and have unique local experiences in Hanoi on our local daily life! Normally, Hanoi starts its new day very early at 6:00am. You can see a road with some vehicles from 6:00am. But the high time of traffic jam in morning is from 7:15 am to 8:30 am. You might not understand why new day in Vietnam starts earlier than some other countries. It is because all of primary student and secondary student will be transferred to their schools by parents. Parents will bring their kids to schools safely before moving to office. While most of working places will start at 8:00 am, all of primary and secondary school will start at 7:15 am. It will help parents go to workplaces on time. When you wake up at 5.30 am, you can take a walk around your Hotel and find some vendor at the local market to buy fresh fruits, vegetables, flower, and raw meat with very low price. Most of these vendors go to market at the early morning are farmers. They usually collect their agriculture products in the very early morning to Hanoi for sale. However, they just sell till around 6.30 am then come back home in countryside area. If you go to market late, you have to buy from retailers with higher price. 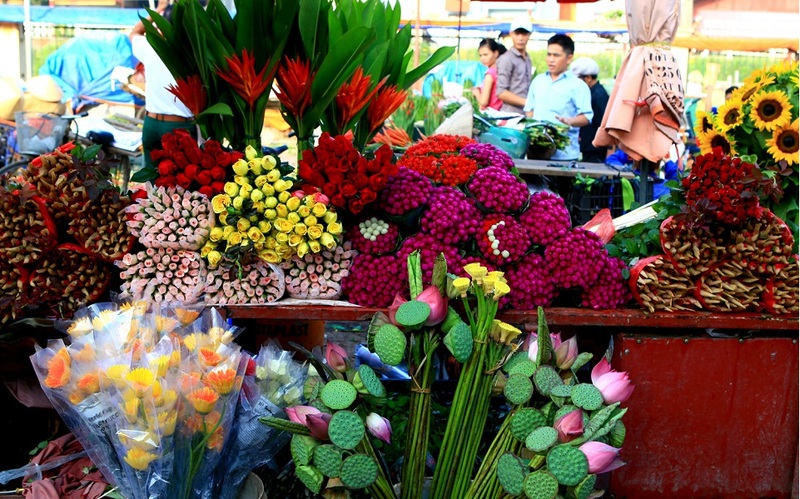 Therefore, a smart Vietnamese housewife will go to market very early to buy fresh foods with the best price. In case you don’t like local markets, you can do some morning exercises around Great Lake, Sword Lake or any Park near your hotel. You will meet many elders walking or running slowly in the early morning. As most people at working age will have to go office very early, so they don’t have time to do morning exercises. The younger usually do their work-out in the afternoon after finishing their working day. In Vietnam, most of hotel will offer you buffet breakfast as a complimentary service. You could enjoy both of Western and Vietnamese foods for your breakfast at hotel. However, the taste of Vietnamese foods at hotel might be modified to be familiar with Western dishes. You should forget one complimentary breakfast at hotel to find some local places to enjoy “Pho”, “Bun” or “Banh mi”. They are top three the most popular foods for breakfast in Vietnam. What are they? Pho is a type of Vietnamese soup typically made from beef stock and spices. To which noodles and thinly sliced beef or chicken are added. It is the most famous Vietnamese dish all over the world. Bun is nearly the same with Pho but its fibers will be smaller than Pho. You can have use Bun with beef, chickens, snails, duck, pork. You will have more options than Pho which is used with beef and chicken only. Banh mi is actually a Vietnamese burger consisting of a baguette with a variety of ingredients. It typically includes meat, pickled vegetables, and chili peppers. I guess that most of you will drink coffee right after wake up and use it during with your breakfast. However, in Vietnam, our breakfast will have a lot of smells and taste. So if you drink coffee and green tea, you can enjoy the taste of food fully. If you don’t try any Vietnamese coffee before, you shouldn’t order a black coffee because of its strong taste. It isn’t very easy for you to drink at the first time. You can try a cup of green tea or a coffee with milk and ice. Vietnamese people usually have a strong coffee cup with condensed milk in the morning to wake up a new day. 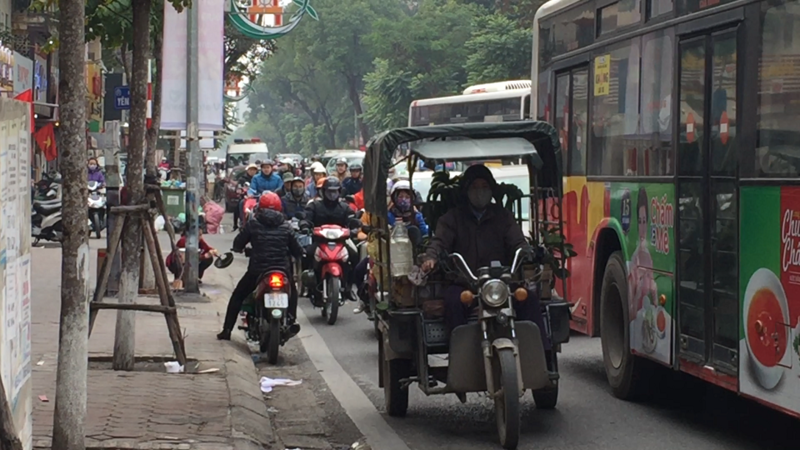 It will be the most special local experiences in Hanoi for every foreigner if they can drive motorbike during rush hour. The road will be crowded and crazy. Do not try to apply any official road rules in Vietnam when you drive a motorbike during rush hour. Some people are asking me how I can drive motorbike safely in traffic jam. The street is full with motorbikes and cars. Everybody has to drive slowly but no rules. Policemen have to work very hard. You will feel our feelings of waking up late and being stuck into a crowded road then you will never go to office on time. Therefore, just keep calm and drive slowly, you will be safe after all. One more rule you should follow is do not forget your helmet because it will help you protect your head in case of accidents. Besides, you can avoid the police from asking for “tea money”. You can take back your hotel after crazy local experiences with Vietnamese traffic. You should have a rest and wait for lunch time around 12.00 pm. At this time, most of workers and staff will go out for lunch and enjoy the break. Like in the morning, they will go to some small local restaurants or vendors to enjoy lunch. After that, they will go to coffee shops near their offices to enjoy the break time and chat together. The working time in the afternoon will start at 1.30 pm and end at 5.30 pm. At 5.30 pm, you will never imagine how crazy traffic is. It will be much more crowded at this time. I don’t know why but I suggest you not to drive motorbike into street from 5.30pm till 7.00pm. It is the crazies rush hour on every road. You can see the streets are full and the sidewalks becomes roads. I have to say that this is “Battle rush hour traffic for home”. It is the worst time of a day especially after a hard-working day. 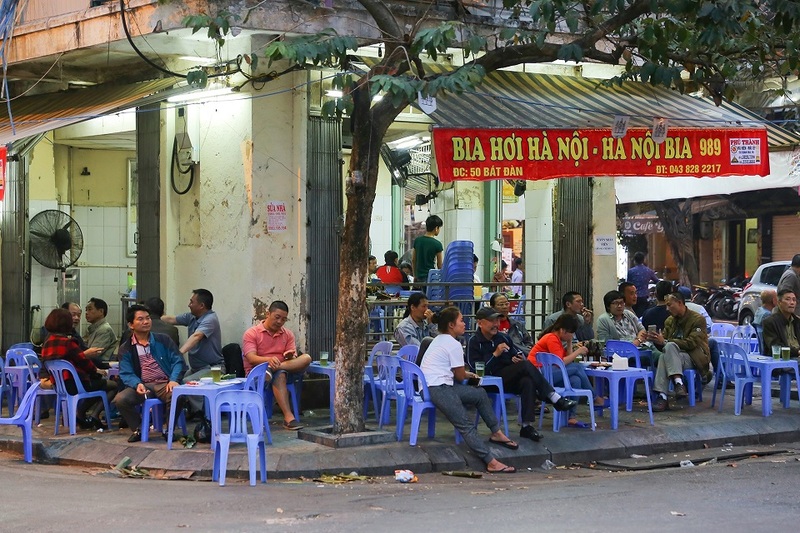 At the end of the day, men will join friends for a beer on many “bia hoi” street corners which is common throughout the country particularly in Hanoi while women take care of kids and make preparation for dinner. Once men come home typically around 7.30 pm, dinner is ready. All family member can have dinner together and talk to each other about their working/school days. Some people think that it is not fair for women and ask for Vietnamese men’s role in their family. It is considered as a very traditional culture in Vietnam. However, nowadays, everything has been changing more and more. There are many husbands coming back home on time and helping their wives with dinner preparation and taking care of kids. Back to what you should do, you can enjoy you dinner at a restaurant. 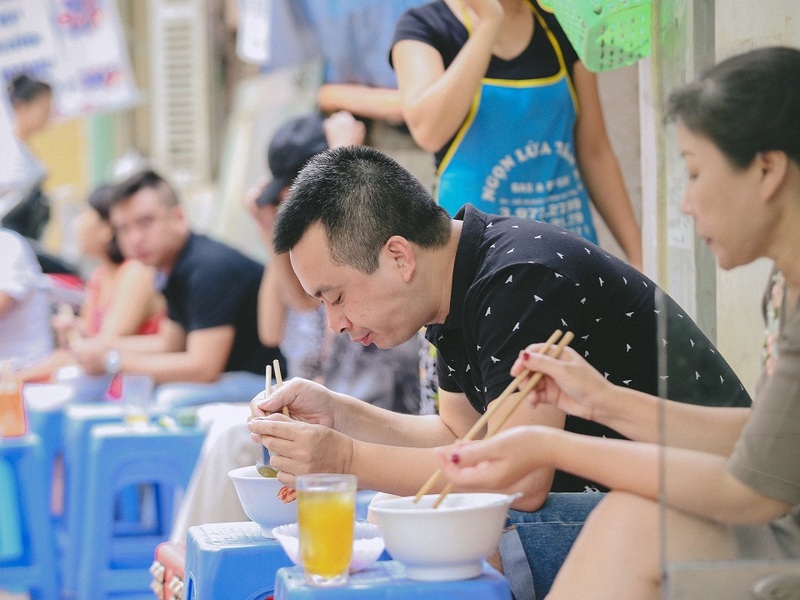 But I think you should walk into the Old Quarter for a “bia hoi” shop, then enjoying with some typical Vietnamese foods. If you want to know more detail about “Bia Hoi” and the most popular foods for drinking beer in Vietnam, please to review my last post: Cheers! Keep calm and drink Bia hoi in Vietnam. 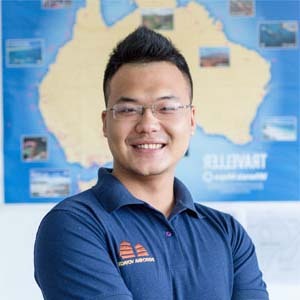 I think it will be a very memorable experience for you when you travel to Vietnam. How cool you are when you come back home with a cut hair from a roadside barbers in a third-world country like Vietnam. 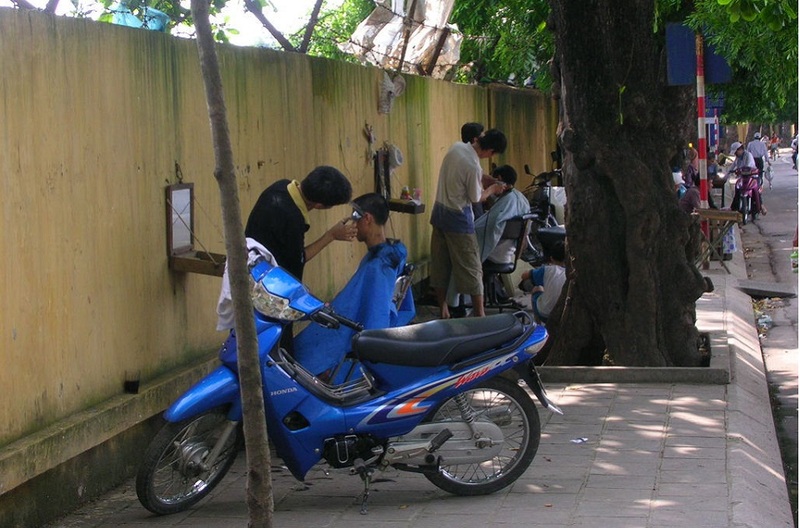 Roadside barbers: It is not difficult to find them when you get out of touristic areas like Old Quarter. I can’t recommend anyone in particular, so you’ll be taking a bit of a risk. But if you’re a man and you just want a quick trim or a shave, do not worry so much because all of them can do these very well. However, if you want to find a good barber for your hair in required style, you can watch how they cut for other customers and evaluate if their skill can be good for you. The price for one haircut is from VND 30,000 – VND 35,000. Find some stores with “Cat Toc Nam” (male hair cut) signs. The price can be higher than pavement a little bit but the final result might not be significantly better to a pavement cut. However, it’s a bit more private and the more expensive places will have hair cleaning as well. I hope that with my blog, you can have an overall view of our daily activities. Then you will arrange one day by yourself and try as much as unique activities for local experiences in Hanoi I have mentioned. 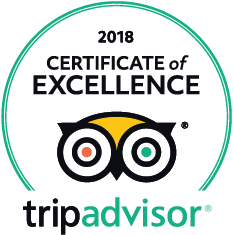 If you don’t have much time and need someone to guide you through those activities, let’s have a look at Hanoi walking tour and ask for expert’s advice.